Today, I am going to share those books with you. As a Java developer, I had worked on a project with no active DBA for the team and you as a programmer have a responsibility to create, update and understand existing PL/SQL stored procedure. What this means is, you need to know the PL/SQL, if not at expert level but up to an intermediate level to deal with your day to day task while working on a Java project involving Oracle database at backend. Btw, let me tell you that these books are from an application developer's perspective and not for DBAs. So, if you are a DBA or want to become an Oracle DBA, you better check out courses like Oracle DBA 11g/12c - Database Administration for Junior DBA, which is more DBA focused. Without wasting any more time, here is my list of some of the great books to learn Oracle database and PL/SQL programming. I have read most of them, not completely but have referred them every now and then. These are a great resource to learn Oracle 10g, Oracle 11g and even Oracle 12c version of Oracle database. This book is written by Steven Feuerstein, one of the most famous names in the world of Oracle PL/SQL programmer and highly regarded as an expert. This book is your complete guide or reference book about Oracle PL/SQL programming. If you are not understanding a particular code, syntax, or a keyword, this is the book you should refer. 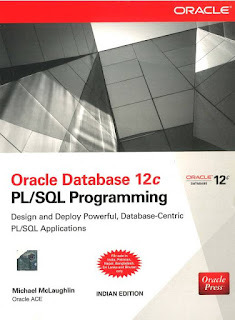 The full title of the book is "Oracle PL/SQL Programming: Covers Versions Through Oracle Database 12c 6th Edition", which also means that it covers the latest version of Oracle database i.e. Oracle 12c. I love the Murach series, having been previously read their Servlet and JSP book, I know what to expect from a Murach's Oracle book and it didn't disappoint me either. 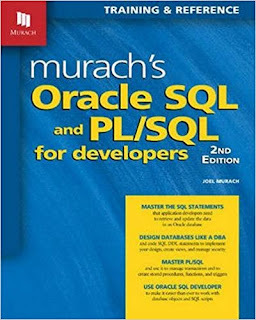 The Murach's Oracle SQL and PL/SQL for Developers by Joel Murach. If you use Toad to interact Oracle database then you would find this book the little bit different because it uses SQL developer, a free Java-based tool, but since I have used both of them in a different project, it wasn't a problem for me. I highly recommend this book to any new programmer who is starting with SQL but with Oracle database e.g. Oracle 10g or Oracle 11g. It is filled with non-trivial example and quite readable in every sense. Another good book to learn Oracle database and PL/SQL programming by Michael McLaughlin. It's also one of the most up-to-date books on Oracle PL/SQL programming covering the Oracle 12c database. Like others, it is also filled with concepts and examples but what I like more about this book is additional information given in the appendix section, which is truly awesome. 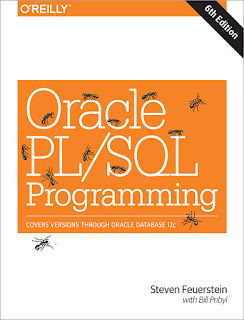 You can use this book as a textbook to learn Oracle PL/SQL programming. This is another gem by Steven Feuerstein, one of the best, must-read book for any experienced or intermediate programmer, who knows how to use Oracle PL/SQL programming language. This book is filled with lots of advice on how to make most of PL/SQL, how to use things in the right way and best practices acquired by Steven from his years of experience with Oracle PL/SQL programming. I have a copy of this book and I often look back into it whenever I get some time or whenever I need to know the right way to use any feature of Oracle database. 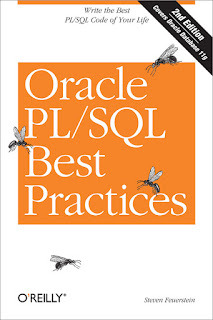 That's all about some of the best books to learn Oracle PL/SQL Programming. As a Java developer, you need to learn a lot of different technologies to become a full stack developer or to perform your day to day task. I had worked in Java project which uses Oracle, SQL Server, MySQL, Sybase and IBM databases in the backend. In fact, every new project comes with a new database and set of new technologies, so don't think that just learning Java would be enough. If you come across any other Oracle's PL/SQL programming book then doesn't forget to leave a note, I just love good books. Thanks for reading this article, If you like these Oracle books and courses then please share with your friends and colleagues, it makes a lot of difference. If you have any good Oracle book to suggest, please leave a comment.